London: The family of Jagtar Singh Johal, a UK Sikh citizen arrested by Punjab police on November 4 from Rama Mandi in Jalandhar has issued a written statement. The family of Jagtar Singh was visiting Punjab for his own wedding that took place last month, said that “our world was completely turned upside down when we received the call about Jagtar’s abduction and detention by the Indian police”. The Johal family said Jagtar’s two brothers immediately travelled to India to inquire and clarify any misunderstandings, in turn they along with other family members including Jagtar’s wife faced harassment and intimidation by the same poke force. Unable to confirm Jagtar’s location or condition and without being able to meet or visit him the brothers returned to the UK, but not without raising the issue directly with the British High Commission in both Delhi and Chandigarh, were they also handed over Jagtar’s British passport. 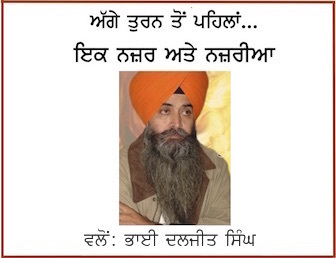 The family has sought support to raise voice against arrest and detention of Jagtar Singh. We are all deeply shocked and worried about the safe, and wellbeing of our beloved son and brother, Jagtar Singh Johal. Our world was completely turned upside down when we received the call about Jagtar’s abduction and detention by the Indian police. The whole family were enjoying the happiest time together following Jagtar’s wedding only weeks earlier. However this happiness was shattered for us all and the newlywed couple as Jagtar was taken away. His two brothers immediately travelled to India to inquire and clarify any misunderstandings, in turn they along with other family members including Jagtar’s wife faced harassment and intimidation by the same poke force. Unable to confirm Jagtar’s location or condition and without being able to meet or visit him the brothers returned to the UK, but not without raising the issue directly with the British High Commission in both Delhi and Chandigarh, were they also handed over Jagtar’s British passport. • We do NOT require any financial assistance at this stage and request for no one to collect any funds for Jagtar without the family’s consultation. 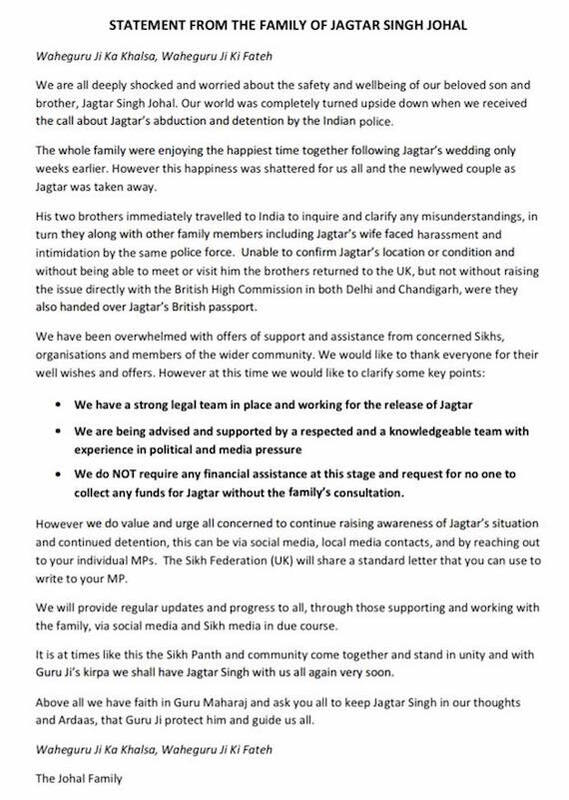 However we do value and urge all concerned to continue raising awareness of Jagtar’s situation and continued detention, this can be via social media, local media contacts, and by reaching out to your individual MPs. The Sikh Federation (UK) will share a standard letter that you can use to write to your MP. We will provide regular updates and progress to all, through those supporting and working with the family, via social media and Sikh media in due course. It is at times like this the Sikh Panth and community come together and stand in unity and with Guru Ji’s Kirpa we shall have Jagtar Singh with us all again very soon. Above all we have faith in Guru Maharaj and ask you all to keep Jagtar Singh in our thoughts and Ardaas, that Guru protect him and guide us all.